The definitive biography of Everett Ruess, the artist, writer, and eloquent celebrator of the wilderness whose bold solo explorations of the American West and mysterious disappearance in the Utah desert at age 20 have earned him a large and devoted cult following. Wandering alone with burros and pack horses through California and the Southwest for five years in the early 1930s, on voyages lasting as long as ten months, Ruess became friends with photographers Edward Weston and Dorothea Lange, swapped prints with Ansel Adams, took part in a Hopi ceremony, learned to speak Navajo, and was among the first "outsiders" to venture deeply into what was then (and to some extent still is) largely a little-known wilderness. When he vanished without a trace in November 1934, Ruess left behind thousands of pages of journals, letters, and poems, as well as more than a hundred watercolor paintings and blockprint engravings. Everett Ruess is hailed as a paragon of solo exploration, while the mystery of his death remains one of the greatest riddles in the annals of American adventure. David Roberts began probing the life and death of Everett Ruess for National Geographic Adventure magazine in 1998. Finding Everett Ruess is the result of his personal journeys into the remote areas explored by Ruess, his interviews with oldtimers who encountered the young vagabond and with Ruess’s closest living relatives, and his deep immersion in Ruess’s writings and artwork. 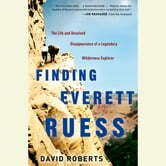 More than 75 years after his vanishing, Ruess stirs the kinds of passion and speculation accorded such legendary doomed American adventurers as Into the Wild’s Chris McCandless and Amelia Earhart.